Magnesium is the structural metal with the lowest density (1740 kg/m^3), and is one of the most abundant elements in the earth’s crust. Very strong magnesium alloys would have great value in a wide range of applications, including transportation and vehicular protection. We seek to control and enhance the dynamic performance of this lightweight metal through experimentally validated modeling and design of the strengthening and failure mechanisms, including deformation twinning. Boron carbide has unrealized potential of dramatic improvements in ballistic performance for vehicular armor at very low weight. We will seek to understand and control the dynamic failure processes in this armor ceramic material and improve its dynamic performance by eliminating weak links at the atomic and microstructural levels through multiscale modeling, advanced powder synthesis, control of polytypes, and microstructural improvements. Ultra High Molecular Weight Polyethylene (UHMW PE) has the potential for significant improvement in mechanical properties. UHMW PE is used in a wide variety of military applications in both tape and fiber forms, but its tensile strength remains an order of magnitude below the theoretical value. We will seek to determine the roles of atomic scale defects, chain length, degree and length scale of crystallinity in determining and limiting the mechanical response under extreme dynamic conditions. Composite materials subjected to dynamic loads are essential examples of high performance systems rather than materials in the conventional sense. We will develop the fundamental understanding of the role of interfaces, component interactions and composite architecture over the full range of length scales and time scales that are manifested in the system during the dynamic event. In order to focus on the complexities raised by the interfaces and architectures rather than a new material, we have chosen S-2 Glass/Epoxy as our model composite system. 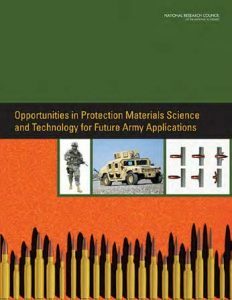 In 2010, two National Research Council boards established a committee to examine opportunities in protection materials science and technology for future Army applications. This committee recommended that the Department of Defense establish an initiative for protection materials by design. This initiative would include a combination of computational, experimental, and materials testing, characterization, and processing research to be conducted by academia, government, and industry. 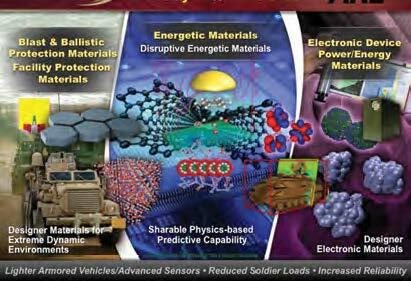 In response to the committee’s recommendation, in April 2012 the Army Research Laboratory (ARL) established a framework to integrate the Army’s multiscale basic research in materials into one coordinated enterprise. 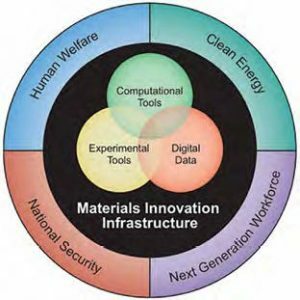 Called the Enterprise for Multiscale Research of Materials (EMRM), the focus of the program is to develop a materials-by-design capability for the U.S. Army using validated multiscale and multidisciplinary modeling capabilities to predict material structure, properties, and performance. The Enterprise enables ARL to coordinate its in-house activities with extramural research efforts. The EMRM is organized into four major areas: protection materials, energetic materials, electronic materials, and cross-cutting computational science. advancing the fundamental understanding of materials in high-stress and high-strain-rate regimes, with the goal of developing a materials-by-design capability for these extreme environments. This 10-year agreement, valued up to $90 million, represents a significant investment and demonstrates the importance of the design of protection materials to the U.S. Army. The MEDE program also supports the Presidential Materials Genome Initiative (MGI) for Global Competitiveness. Established in June 2011, MGI aims to double the speed at which materials are discovered, developed, and deployed. The MEDE program represents one of the Department of Defense’s largest investments in extramural basic research in support of the MGI. U.S. Army illustration depicting the EMRM. Materials Genome Initiative diagram. MEDE focuses on developing the experimental and computationsl tools needed to develop protection materials for national security.